The Technology Help Desk maintains a knowledgebase full of useful information to help guide you through the technology used at NMC. 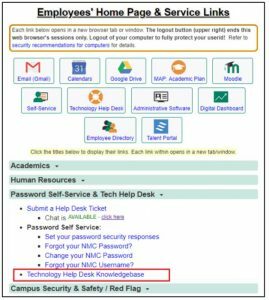 To access the knowledgebase, from your myNMC homepage click on the “Technology Help Desk Knowledgebase” link below Password Self-Service & Tech Help Desk. In addition, Students have access to a Technology Help Desk Knowledgebase at students.nmc.edu/help.